Establish utilities in your name. If you’re new to the state, local power companies may require a deposit on your first bill. Most Springs communities will set up your water, sewer and trash, and any fees will be added to your account, payable with your next rent payment. Be sure to ask a Springs team member about telephone, cable and internet providers so you don’t waste time calling providers that won’t service your area. Finally, if you’re interested in getting a satellite dish, be sure to discuss needed deposits for your particular community! Purchase liability and renter’s insurance. While Springs communities only require liability insurance, we highly recommend the purchase of renter’s insurance as well. See our recent blog post about renters insurance for more information. Have lamps. Not all communities provide overhead lighting in the bedroom or living room areas. The last thing you want to do while unpacking is make a trip to the store because you can’t see at night to set up your new home! And don’t waste time trying to figure out which outlet to plug in to - our team members can show you which light switches control those outlets ahead of time. Make sure you vehicle tag hasn’t expired. All Springs communities work hard to ensure their parking lots are void of inoperable vehicles or automobiles with expired tags. Avoid a ticket for towing by keeping your tag current on any vehicle parked on property. Movers. Anyone with a computer can Google moving companies to help them get from point A to point B. But, our Springs communities often have partnerships with movers who will offer discounts. Give us a call for a referral. Be sure your pet is up to date on its vaccines. All communities require current proof of vaccinations for any pets living in your home. It might be low on the list of things you think about, but it is required before you can receive the keys to your new home. Pack an “essentials” bag. There are few keys things you’ll want to have close at hand when you get to the new apartment. Grab an overnight bag and include some snacks, a roll or two or toilet paper, a bar of soap, a toothbrush and toothpaste, a washcloth and towel, any medications your need and your cell phone charger. Label your boxes. When most people go into packing-mode for the first time, they think of getting the job done as quickly as possible. We encourage you to work smarter, not harder! Label your boxes so that you or movers (or your friends who are waiting for the pizza and beer) can place them into the room where they belong. This will save you tons of time and is one tip that movers value the most. Submit a change of address form. Whether you’ve been living with family or friends or moving from a dorm, you’ll probably get mail delivered to you at your previous address unless you direct it to your new address. Submit a change of address form so you receive bills and other mail without any delay. Plan a packing/unpacking party. 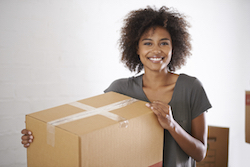 You’d be surprised how many people are willing to help you prepare for your moving experience! Grab a few bottles of wine or a case of beer and call for pizza, friends and family! Nothing makes the packing or unpacking job easier than a few extra hands and it will help relieve the anxiety of your move! Everyone has a favor they can return—call in that favor at a time when you could use it most!